When it comes to audiobooks, I’m a more eclectic reader than I am with the printed volumes. Sure, I love listening to books I’d probably read or have read anyway – I’ve listened to all the novels of Jane Austen, for example, and whenever I get a new installment in Alan Bradley’s delightful Flavia de Luce series, I enjoy reading it and then listening to it (I can’t do British accents in my head, so I like to hear the real thing). I’ve enjoyed listening to many a recent literary or mystery novel. But I’m also more likely to tackle a serious, weighty nonfiction book when I’ll be listening rather than turning pages, and when they are being read to me, I try novels that are out of my usual range of interests. Then sometimes, I need a break. Sometimes, I just want pure entertainment in my audiobook. When that mood strikes, I reach for one of Clive Cussler’s many offerings, and I’m grateful that he and his associates are so prolific. 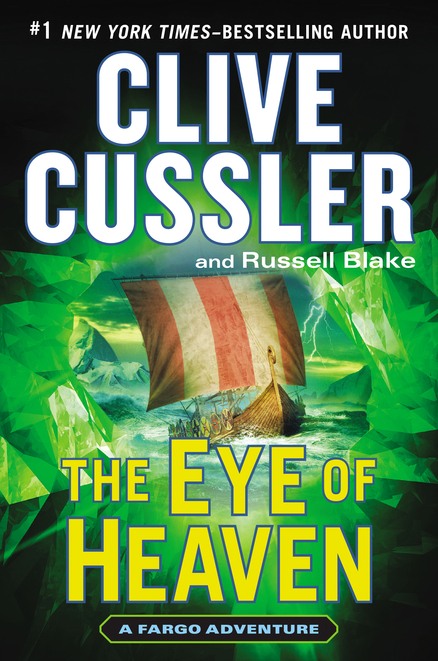 Cussler has several adventure series going, and they’re all great listening. They’re fast paced but easy to follow, and they always incorporate fascinating information about archeology, history, national defense, exotic lands and/or the sea. Sure they follow a formula of sorts, and there’s little in the way of complex character development. But the ever-changing settings, plots and challenges keep the stories fresh, and listening to them is just plain fun. They are perfect books to pop into the CD player when traveling with family. Think of listening to Clive Cussler audiobooks as something like going to an Indiana Jones movie. Here are quick looks at three I’ve enjoyed recently. 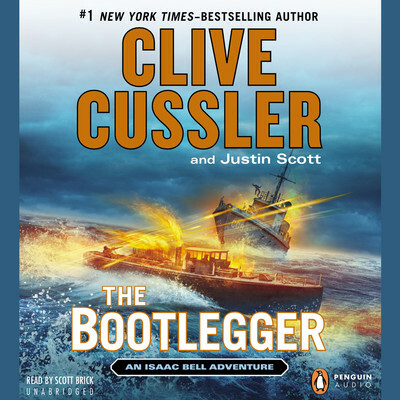 All – as indeed every Clive Cussler book I’ve ever heard – are read by Scott Brick, who is perfect for the job. THE EYE OF HEAVEN. 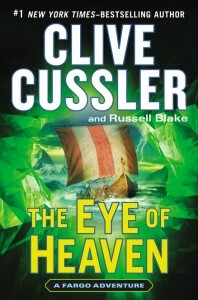 By Clive Cussler and Russell Blake. Read by Scott Brick. Penguin Audio. 9CDs. $46. This is the latest in the Fargo series, starring Sam and Remi Fargo, the fabulously wealthy husband and wife team who travel the globe hunting for treasure, which they turn over to local authorities for preservation, of course. They are fearless, skilled divers. They have the enviable ability to wine and dine lavishly and still stay in perfect shape, able to scale mountains, descend into snake-infested tombs, subdue gangsters and outwit nefarious enemies of all stripes. But I digress. These books are just plain entertainment, and it’s all part of the fun. This time out, the Fargos’ quest for treasure and knowledge takes them from the Arctic to remote areas of Mexico – with a daring side trip to Castro’s Cuba. They are trying to learn more about an apparent connection between the Vikings and the ancient Toltec feathered-serpent god Quetzalcoatl. Not to mention trying to find the fabled gem known as the Eye of Heaven. The action is fast-paced (the Fargos have a private plane ready when needed), taking them and their colleagues to ancient temples, secret tombs and into the wilds of the jungle. And, as always, there’s also a lot of fascinating information woven into the tale. And, as always, there are multiple enemies out to thwart the Fargos, steal the treasure, wreak vengeance for perceived wrongs and otherwise do them harm. It’s not clear who can be trusted. Could this be the day when Sam and Remi meet their match? Nah. Probably not. Clive Cussler has too many more books to write. Thank goodness. THE BOOTLEGGER. By Clive Cussler and Justin Scott. Read by Scott Brick. Penguin Audio. 9 CDs; 11 ½ hours. $39.95. I’m a fan of recent history, so I love Clive Cussler’s series starring Isaac Bell, a detective for the Van Dorn Agency in the early 20th century. Bell gets into all sorts of adventures, dangerous of course, but also yielding much fascinating information about those tumultuous times. Earlier books in the series have provided, for example, interesting tidbits about the cutthroat competition in the early motion picture industry, including Thomas Edison’s role, and intriguing stories about espionage surrounding World War I. This one deals with Prohibition, specifically bootlegging and all the associated crime that misguided policy engendered. Joseph Van Dorn, Bell’s boss and longtime friend, is seriously wounded in a shooting when he’s helping to chase after a rum-running boat. Bell sets out to track down the shooter and, of course, finds himself involved in something much more complex than he ever imagined. Bootlegging means big money, and that money has drawn the interest of those who are hoping to bring down the United States of America. Communists, Russians operatives and homegrown mobsters all get into the action as Bell moves from New York to Detroit and on to Florida on the heels of his villains. Bell also, of course, has a beautiful wife, who happens to be involved in the fledgling movie industry. MIRAGE. 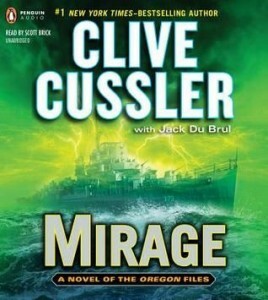 By Clive Cussler and Jack Du Brul. Read by Scott Brick. Penguin Audio. 10 CDs; 12 hours. $39.95. This Oregon Files series stars Juan Cabrillo, the captain of the Oregon and head of the Corporation, a group sponsored by the U.S. government that travels the world taking care of secret missions. The Oregon is a marvel of the latest technology, but to the casual onlooker it’s just a rusty old ship that’s seen better days. This one involves Nikola Tesla, a U.S. destroyer that vanished in 1943, a rogue Russian admiral and all sorts of amazing secret weapons. Needless to say, there’s a great deal of danger, including the possibility of what could be the third world war as well as physical threats to Cabrillo and crew. The action is fast, the technology is amazing, and the story – including the historical flashbacks – is gripping. Happy listening! This entry was posted in Action/adventure, Audio Books and tagged adventure, audiobooks, Clive Cussler. Bookmark the permalink.